In 2008, the Company implemented Capital Reserve Capitalizing Plan. According to the Plan, the Company issued additional 2,187,089,000 shares in total, 5 for every 10 shares, to all members of the Company with the base of total shares 4,374,178,000 on December 31, 2007. The number of total shares after the increase was 6,561,267,000. 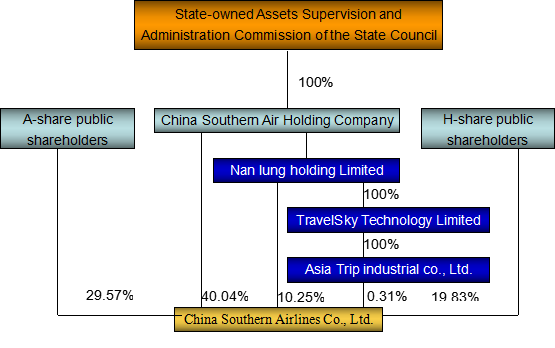 In August 2009, the Company completed issue of 721,150,000 A-shares to China Southern Airlines without through public offering and additional issue of 721,150,000 overseas listed foreign-funded shares (H-shares) tailed for Nan Lung Holding Limited. Total capital after the issue was 8,003,567,000 shares. In November 2009, the Company completed issue of 1,501,500,000 A-shares to 9 certain investors and additional issue of 312,500,000 overseas listed foreign-funded shares (H-shares) tailed to Nan Lung Holding Limited. Total capital after the issue was 9,817,567,000 shares. In August 2017, the Company completed issue of 270,606,272 overseas listed foreign-funded shares (H-shares) to American Airlines Group without through public offering. Total capital after the issue was 10,088,173,272 shares.